This is a short hunting story that takes place in Namibia, Southern Africa. This story is about an animal that is perceived as cute by many who do not know the wild world. The world of nature can be beautiful, but nature can also be cruel. I would beg anyone who judges this story to read, watch, and learn some facts about wild life before passing judgement. In August of 2007 I journeyed to a farm in Northern Namibia. It was my first African Safari. My host was Barry, whose ancestor, William John Burchell, explored Southern Africa in the early 1800's. This ancestor was a naturalist and a painter and he left an extensive record of his travels. Barry was a great host and he treated me like royalty. Barry and I harvested many head of Plains Game. The hunt was everything I had dreamed of. Once, on our travels through the Veldt and Mopane woodlands, we came upon an extensive plain where the tall grass grew. There were tall Mopane trees at the edges of the plain. I spotted some black objects in the trees. With my binoculars I could make out Monkey like creatures clinging to the branches. Barry said they were Baboons. He said he does not like Baboons much. Barry said they play mischieviously with his water pipes at the waterholes. The Chacma Baboons were too far for a shot and Barry said the plain was much too open for a stalk. A Baboon was not on my bucket list, anyway. One evening, Barry and I were sitting in a hide next to a large waterhole. All of a sudden, a dainty little Steenbok with very long spikes of horn appeared. I had not booked a Steenbok even though it was a very good trophy. Next, came a herd of thirteen juvenile Kudu Bulls. They all had horns but they were not trophy size. The future looked good for Barry. The Kudu were watering when there was a commotion. A large troop of Baboons appeared out of the woods. The Baboons chattered loudly and hooted. They proceeded to scare the wildlife from the waterhole. The Baboons were big, black, and menacing with long arms and Leopard sized teeth. They were evil looking. The Baboons sensed our presence. They were very cautious and stayed far from the blind. In a few minutes, they were gone. They had disappeared as quickly as they had appeared at the waterhole. Barry said that the hunting was all over for the night. The Baboons had scared the game away. tame. I never saw another wild Baboon in five more Safaris; that is, until I went to central Namibia. I was on a beautiful ranch owned by my good friend Jan, an old time Namibian. 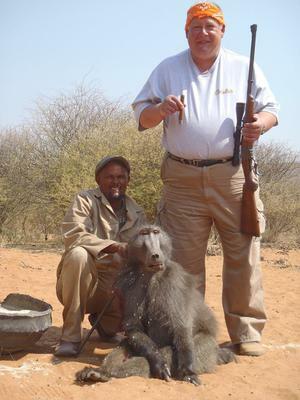 I had booked a Baboon hunt with Jan in August of 2013. He said I could shoot all the Baboons I wanted for they were nasty creatures that break water pipes and bite the udders off of sheep and wild game. Sounded quite nasty to me too. Jan told me a story about a Czechoslavakian hunter who had hunted Baboons on his ranch. The Czech could not speak very good English. Well, the Czech shot a Baboon and came walking up to the entrance to the house and said, "Die Papilon is Todt!" Jan got a great laugh out of that. Jan placed me in a blind with a container of Corn as bait. He said the Baboons had been coming to the bait. I had a reasonable chance of seeing a Baboon. My firearm was a Ruger #1.375 H&H Mag with Remington Express 270 gr cartridges. I had harvested a lot of Plains game with this combination. The rifle carried a Leupold 40mm XV-I 3X9 scope. I place the scope on 3x. I waited in the blind for two hours. No Baboons showed up. Jan called me on the radio and asked if I would like to return to the lodge for tea. I said, no, I would wait for a few more hours. Jan and his wife, Marie, were content to enjoy their tea while I hunted! This is very unusual. I can tell you that not more than two minutes after Jan called me, a large black male Baboon appeared quietly and stealthily. He sure surprised me! The big male was alone; I had expected an entire troop. I immediately raised my rifle and centered the crosshairs on the Baboon's chest. He was reaching for the corn; his hands were in the cookie jar, you might say. I squeezed the trigger and the Big Baboon dropped over the corn with his hand outstretched. The bullet had pierced his heart. I got on the radio and called Jan. He and Marie were enjoying their tea and bread and marmite and honey. I said,"Papilon ist Todt!" Jan started chuckling and said he would be right there. When Jan saw the Baboon, he said it was the largest ever shot on his ranch. He told me that I was killing all his big animals! When we brought the Baboon to Trophaendienste Taxidermy in Windhoek, Andre du Toit said it was one of the largest Baboons he had ever seen. I am keeping the skull of this Baboon. It has teeth as large as a Leopard's; however on this old specimen, the teeth are a little worn. I envy you!!!! It is only a dream for me, I can not really afford the pleasure of flying down to Africa to hunt these beasts. What a great hunt you did ! Great Photo; like the seegar!